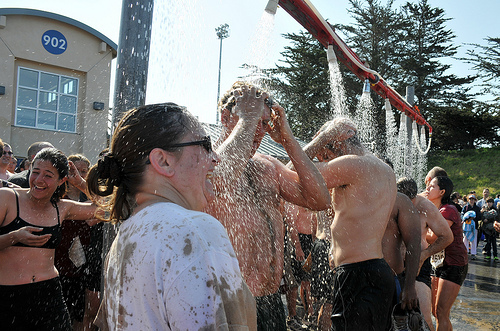 You decided to do a mud run; you put in the training, you got dirty and hopefully, you had a blast. There’s only one thing left- the cool down. Here are five things to keep in mind after you’ve crossed the finish line. Or better yet- don’t collapse! You reached your goal, and it’s a safe bet to say that you’ve just finished one of the most grueling physical challenges of your life. Good for you! Pat yourself on the back, take a deep breath, and find a place to start running again. There are few other things that compare in importance to allowing the body an opportunity to wind itself down after strenuous exercise. Treat your body right and allow your blood pressure and heart rate to return to normal levels slowly. You are most likely going to be sore tomorrow, but a quick jog should help prevent the kind of pooling in your extremities that can make it unbearable. That, and you will be less likely to pass out from dizziness or spikes in blood pressure. If you really are too exhausted to keep running (and that could happen), don’t sweat it! Walking for 10-15 minutes can give you many of the same benefits of the more traditional jog, with the added benefit of giving you time too really take in the awesome mud run atmosphere. Find clean water to down after you’ve crossed the finish line and slowly over the course of your cool down. Not all mud runs hand out free water, so it is always a good idea to bring a bottle and a friend to watch it. 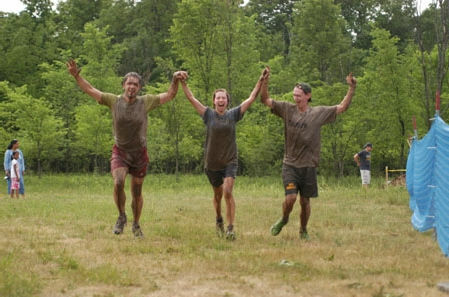 Bonus points if you can convince your friend to join you at the next mud race. Make sure you get in a good deal of static and dynamic stretching, hitting all of your major muscle groups. You have used everything you have today, so make sure you treat everything nice. Your body will thank you later. You’re exhausted, but sleeping too soon after your mud run can cause lactic acid build up- again, more pain. Instead, enjoy the place and hang out with your friends. Half the fun of running events is the camaraderie that you find when people come together to share their passion. A good mud run is the same, just on mud-steroids. Face it; there is something special about hundreds of grown adults basically playing around in the mud. Depending on what race you are at, you might see everything from mud covered marines to people completing the race dressed up in giant chicken suits (don’t ask). The point is, take your time and enjoy the surroundings…just keep moving! Have your own mud run tips? Leave a comment below or on our Facebook fan page.